You look at the photo and realize that you ALMOST got a great shot, but there’s something glaringly wrong with it. In this case, I’d focused on the wasp when it was sitting on the flower and it decided to fly away between the time I focused and clicked the shutter release. As a result, the wasp is out of focus! So annoying! If I’d just been a few millimeters closer to the wasp, it would have been awesome. Alas, it’s out of focus and it’s the only shot I got. Sigh… What can you do? Sometimes that’s just the way things turn out, but it doesn’t make it any less frustrating. I love it shooting Dolichopodids with TTL flash. Frame the insect, the insect is there. Take the shot the insect is still there. Look at the shot, see that damn fly flew out of frame for the shot, them landed back in the same spot before you realized it. Yes! Those little guys are SO annoying to shoot. I don’t think I’ve gotten more than a few halfway decent shots of them, and none that I would say was actually good. They’re just so darned jumpy! Hello! Just curious as to what type of wasp that is? 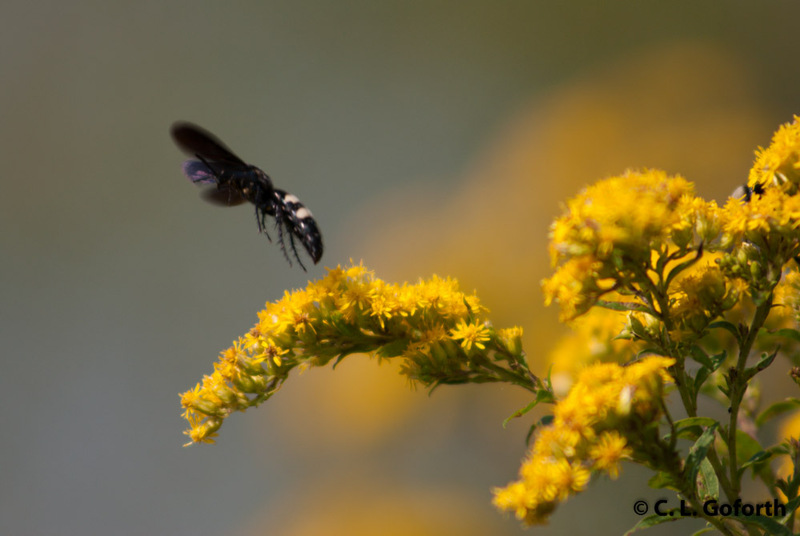 I’ve had them on the goldenrod here, and have wondered if they were a wasp or hornet. Unusual striping. Thank you! They’re scoliid wasps (pronounced sko-LEE-id)! They don’t have a common name, so they get their name from their family, Scoliidae. They’re parasites of beetle larvae and lay their eggs on beetle grubs, but they feed on nectar as adults and seem to REALLY love the goldenrod. We see them on the goldenrod here all the time! Beautiful wasps, and good to have around if you have problems with scarab grubs in your garden. I find the photo just delightful–sometimes slightly imperfect photos show me even more interesting things! I ove seeing it in flight like that. Thanks for the info as well. Glad you like it in spite of the imperfections! I love to capture them digitally, too. Especially annoying when they look great on your camera display but once you download them, they don’t look quite the same. Yep! That happens a fair amount too. Glad other people have these problems!